Bora-Care is a borate-based product that provides prevention and control of Termites, Carpenter Ants, Powderpost Beetles and Decay Fungi. Bora-Care can be used on all cellulosic materials including wood, plywood, particle board, paper, oriented strand board (OSB), cardboard, and wood composite structural components. If you are looking to kill and prevent mold, please see Bora-Care with Mold-Care. Also, a dye can be added to the Bora-Care solution when treating studs or wood inside wall voids called Turf Mark Blue. Bora-Care cannot be applied to any live trees or plants. Wood Destroying Fungus, Termite Control and wood-destroying insects such as termites, carpenter ants, powderpost beetles, etc. For powder post beetles, Bora-Care must be used on untreated wood. It is preferred over other treatments such as timbor in treating furniture because Bora-Care dries clear and will leave the furniture in its natural state. It will also absorb much further into the wood so you know the infestation is treated. Bora-Care is diluted with water at a 1:1 - 1:5 ratio depending on the pest you are targeting. One gallon of Bora-Care will treat approximately 100 lineal feet of 2 x 4 stud wall. This includes sill plate and header. For other dimensional lumber, logs, or siding and plywood, please see the product label to the left. 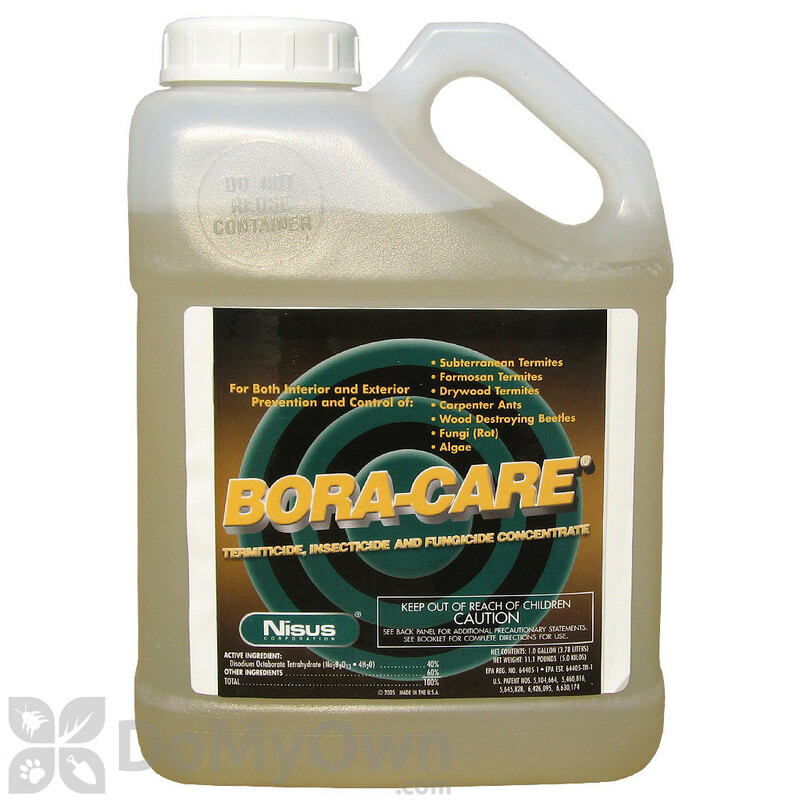 Typically, one gallon of concentrate Bora-Care will treat 800 square feet of a 2x4 stud wall, and 500 square feet of a crawl space or attic. Preventative use rate is 1:1, 2:1, 3:1, or 5:1 Refer to the label for complete instructions. Bora-Care contains an inorganic borate salt, soluble in water, with insecticidal and fungicidal properties effective against wood destroying organisms. A patented carrier system allows Bora-Care’s active ingredient to diffuse into wood. This system makes Bora-Care more effective than products designed to treat only the wood’s surface. It is particularly suited for seasoned or kiln dried wood. Bora-Care provides double protection by acting as both a toxicant via ingestion and a deterrent to termite tubing. This means that termites are kept out of structures, preventing wood damage. When termites or other wood-destroying insects ingest Bora-Care, the borate active ingredient poisons the microorganisms in the insects’ digestive tracks that are needed to break down the cellulose in the wood. Essentially, it causes the insects to starve to death. Insects have shown no ability to develop resistance to borates. Bora-Care provides prevention and control of Termites, Carpenter Ants, Powderpost Beetles and Decay Fungi. Bora-Care can be used on all cellulosic materials including wood, plywood, particle board, paper, oriented strand board (OSB), cardboard, and wood composite structural components. Since Bora-Care is applied directly to the wood, it can be used in areas where environmental contamination is of concern. The active ingredient in Bora-Care is an inorganic salt and once in place will not decompose or volatilize out of the wood. Treatment is long lasting as long as the treated material is not exposed to rain, continuous water or ground contact. Bora-Care is most frequently used for pre-construction or post-construction preventative treatment of listed wood-infesting pests on structures. Bora-Care can also be used for remedial treatment of active infestations, such as in attics for treatment of drywood termites. Bora-Care can also be used to treat wooden items like interior trims or furniture, provided there is no stain, paint, or similar finish on the items. In addition to cellulosic materials, Bora-Care also can be used on concrete to prevent termite tubing. Bora-Care can be sprayed, brushed or foamed onto bare wood surfaces and voids. The product cannot be fogged. Wood treated with Bora-Care will appear darker than normal for a few days until the chemical dries in. Bora-Care will not affect the paint or staining of the wood. Wood treated with Bora-Care is non-toxic to humans and animals. 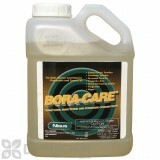 Bora-Care must be diluted with hot water in a bucket and then added to your sprayer. Failure to pre-mix in a bucket will cause your sprayer to clog. Mixing – The use of an impeller-type mixer that can be used with an electric drill aids the dilution process. Always mix in a separate container then add the solution to a spray tank. Use 1:1, 2:1, and 3:1 solutions within 24 hours after mixing. 5:1 solutions will remain stable for up to 30 days. Do not leave unused solution under pressure or in tank overnight. The yield of Bora-Care varies greatly depending on use and total volume of wood to be treated (not just surface area). Typically, one gallon of concentrate at a 1:1 ratio will treat 800 square feet of a 2x4 stud wall or 500 square feet of a crawl space or attic. On non-cellulosic materials, one gallon of finished solution treats 400 square feet of surface area. For siding and paneling, one gallon of concentrate at a 1:1 ratio will treat 800 square feet of 1” wood by spraying only one side. If siding or paneling is ½” thick, the same amount of solution treats 1,600 square feet. *See product label and supplements for charts and worksheets to aid in calculating the amount of Bora-Care needed for your application. See Remedial Injection Bulletin for an easy flow chart of ratios for existing construction treatments. Surfaces: All non-food contact surface cellulosic materials including wood, plywood, particle board, paper, oriented strand board (OSB), cardboard (non-food packaging material), wood composite structural components, concrete, block, brick, metals, PVC plumbing pipes and other non-cellulosic materials found in structures. Use Bora-Care on new construction. For termite pretreatments, simply spray a two-foot tall continuous barrier directly to the wood using a tank sprayer or portable backpack sprayer. This includes the walls, piers, interior slab or basement walls, plumbing penetrations, pipe chases, bath traps, and any other foundation penetrations. Treating this way insures that all termite entry-points are treated. You can also use Bora-Care as a whole-house treatment for general pest protection to prevent infestations of decay fungi and wood destroying pests such as drywood termites and destroying beetles. Remedial Wood Structure Treatment – Spray and/or inject Bora-Care solution into beetle holes, termite and carpenter ant galleries and decay pockets. Apply 1 coat of solution to the point of surface saturation to all infested and susceptible wood, paying particular attention to infested areas. Apply 2 coats to those wood members with only one or two exposed sides. Wait at least 20 minutes between applications. Wood Flooring (Remedial Treatment) – Treat by spray, brush or roller application. Prior to application, remove any existing finish by complete coarse sanding or stripping. Use a 2:1 (water to Bora-Care) solution at a rate of approximately one gallon of solution per 500 square feet of floor surface. Two coats may be required for termite infestations, waiting at least 1 hour between applications. Moisture content must be 10% or less before applying final finish. *Bora-Care may be applied by misting or foaming at high expansion rates into inaccessible wall voids, wall studs, and wood members. (Bora-Care cannot be used in fogging machines.) See product label for complete details. Preventative treatment – For framed wood surfaces above ground, apply a 1:1 solution. Treat remainder of structural wood in a 5:1 solution. Concentrate application in areas susceptible to attack, to include all sills, plates, floor joists, piers, girders and subfloors. Treat all exterior wood including siding, facias, soffits, eaves, roofing, porches, decks and railing. If Bora-Care is the sole preventative treatment for subterranean termites, a 1:1 solution must be used. Buildings on crawl spaces and basements (preventative and pretreatment) – Use a 1:1 solution and apply in a 2 foot uninterrupted band to all structural wood surfaces in crawl spaces and basements. To prevent termite shelter tubes on crawlspace walls, apply to concrete or block walls in a 2 foot band up from the ground on interior wall surfaces. Apply at the rate of one gallon to 400 square feet of surface area. Please read the label for more instructions. *Do not use to directly treat soil. All exterior wood - DO NOT APPLY IN RAIN OR SNOW. Do not expose treated exterior wood surfaces to rain or snow for at least 48 hours after treatment. For longer performance, exterior wood surfaces will require a topcoating with a water-resistant finish such as paint or exterior stain. Apply within 6 weeks of treatment. Bora-Care must dry completely (at least 48 hours) before applying any protective topcoat. Treatment of exterior wood surfaces less than 2 inches thick, such as decks, sheds and fences – Apply only to bare wood or to wood surfaces where an intact water repellent or finish is not present. Remove paint or finish prior to application. Apply one coat of solution to all wood surfaces. Apply two coats to heavily infested areas and to those surfaces where access is limited to 1 or 2 sides of wood members. Exterior wood thicker than 2 inches, Logs, timbers, beams, etc. – Use a 1:1 Bora-Care solution to all surfaces. Treat bare wood only. Refer to application charts for specific sizes of logs or beams. Typically, 2 coats are required to treat round logs 10” or greater in diameter and rectangular logs larger than 6” x 12”. Wait at least 1 hour between applications. When treating around the exterior of structures, cover and protect shrubbery and plants that may be potentially exposed to Bora-Care, since it may be phytotoxic to plants. *Pretreatments can be done IN ONE TRIP. No need to worry about weather delays or pumping chemicals into the soil, crews can remain on the job site during treatment, and treatment will last for many years. *Absorbs all the way into wood for the most complete borate treatment available. *Dries clear, doesn’t affect future painting or staining of wood surfaces. *Emits no VOCs (volatile organic compounds). *Qualifies builders for LEED for Homes points as well as points in many other green building programs. *Bora-Care is the only borate-based termiticide that is EPA-registered as a primary perimeter termite pretreatment for new construction with its own product-specific field efficacy studies. *Bora-Care remains for the life of the treated wood, so no retreatments are necessary (provided wood is not exposed to rain, continuous water, or in contact with the ground). *Always pre-mix in a separate container before filling spray equipment. *Use only on raw wood materials. Bora-Care will not penetrate paint, stain, or sealants. *Older wood boring beetle larvae and especially pupae already present in the wood at the time of treatment may occasionally emerge sometime after treatment. *If finished surface appearance is a concern, a wood cleaner such as Mold-Clean may be used prior to Bora-Care treatment. *The rate at which Bora-Care is absorbed varies depending on the thickness of the wood and, particularly, the moisture content of the treated wood. Higher moisture content will allow for more rapid absorption. * An appropriate dye or colorant such as Turf Mark Blue may be added to the solution when diluting Bora-Care with water to make it easier to see where Bora-Care has been applied. STEP 1: Remove all wet and unsalvageable building material from the site. STEP 2: Completely dry the remaining affected areas. STEP 3: Spray Bora-Care according to the label application directions on all structural wood and building material, including concrete, block walls, foundation penetrations and sheet rock. Allow to dry before rebuilding. Under ideal conditions, Bora-Care penetrates wood over a 4-6 week period and remains for the life of the wood. STEP 1: Wear appropriate protective gear and make sure the electricity and HVAC are off. STEP 2: Begin removing mud, flooded furniture, appliances, carpets, and flooring. STEP 3: Clean thoroughly and disinfect with an appropriate EPA registered disinfectant, sanitizer and virucide like Nisus DSV. STEP 4: Cut out sheet rock 2 feet above the highest water line to allow for proper drying. STEP 5: Open doors and windows to begin circulating fresh air. Use fans and dehumidifiers if available. STEP 6: Use a moisture meter to determine when wood is 19% or less moisture content. STEP 7: Treat all exposed wood using Bora-Care with Mold-Care in a 5:1 Solution. STEP 8: Apply termite protection with a 2 foot band treatment using Bora-Care in a 1:1 solution. Once dry, the home is ready for repair. I had my home sprayed with this for the wood post beetles and they were gone...until today they came back. For over a week not a single one was sighted. This does work on contact but the reason that I bought this product was because it claimed to kill up to twelve months...I didn't even get twelve days of peace. Bora-Care is the best wood treatment product on the market. However, Bora-Care can take up to a month to diffuse completely through the entire piece of wood after you treat it. Since powderpost beetle larvae can be deep in the wood, it is normal to continue to see activity for awhile until the Bora-Care makes it all the way through the wood. Of course the true benefit of Bora-Care is that after it does diffuse all of the way through the wood and kill the larvae, it will stay in the wood forever and you never have to worry about wood destroying insects again. I had a termite control company give me an estimate to spot treat my drywood termites and it was astronomical! I found that DoMyOwnPestControl.com had the same product Boracare for a fraction of the cost. I treated my infestation using the recommendations on the website and now I have a termite free home and more money in my pocket! I have used half a gallon for remediation of dry wood termites on fascia boards by using 1:1 and 1:2 dilutions applied to bare wood and by injecting in drilled holes where the wood is covered by paint. I like this product as well as the Bifen IT, as they are fairly non-toxic to people and animals. I can use both of them extensively without feeling ill effects myself. I added Bifen IT to the Boracare solution to get a 0.12% Bifen IT concentration (double strength). The Bifen IT works as an quick termiticide and the Boracare provides long term protection. Now that I have stopped the active infestations, I can take my time and protect the rest of my house's fascia, rafter and joist board ends with simply painting a 1:5 Boracare dilution on the ends of the boards (where dry wood termites enter). I will need a 2nd gallon of Boracare to protect the entire house and will be ordering soon. For approximately $200 of products from Domyownpestcontrol, I will have done the remediation work and the whole house protection. This has been a lot of work, but I have saved many thousands of dollars, plus I can take my time and know that the job is done right. I don't know why the wood adjacent to my bath tub wet wall was moist? There were no leaks and the plumbing vent to the roof was well sealed. Condensation? The bath drainpipe and water inlets come up through a hole in the slab. The subterranean termite varmints tunneled 10' or 40' under the house slab and surfaced at this point of exposed earth attracted by the moist wood. They swarmed the first warm days in Spring. I treated the exposed earth area with the Dominion 2L termiticide and then filled it with sand. I treated the slab, wood framing, floor and molding with a 2:1 mixture of BoraCare. I sprayed BoraCare down from the attic and drilled holes in the walls where there was no other access. I will finish by treating the ground around the house with Dominion 2L. My problem appears to be solved for under $200. Thanks DoMyOwnPestControl.com! Used product on wall studs, when I was repairing a wall due to termite damage. My project lasted about three days. I used a 1:1 mix and I did not pay too much attention to the one day usage. The product crystalized in my sprayer - took awhile to clean the sprayer. What is the difference between Bora-Care and Timbor that makes the price of Bora-Care cost so much more? They both seem to control the same pests. Container size appears the same. Is Bora-Care more highly concentrated therefore dilutes to cover more? I am confused. Can these be applied by a novice? What protection must one take? Bora-Care and Timbor are both borate products used to treat wood, but they could not be more different. Timbor is in a powder form that is mixed with water. It is much less expensive but it is intended more for protecting new wood only, or wood that you know does not have any issues. Timbor will only penetrate the outer layer of the wood so it is more for protection or for treating fungus on the surface of the wood. If you have an active infestation of termites, powder-post beetles or wood borers deep inside the wood then Timbor would not make it through the wood to kill these insects. 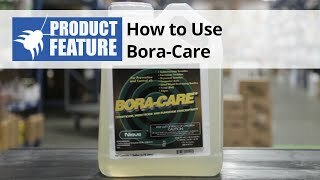 BoraCare is a liquid borate but has an additive, a glycol solution, which allows the product to penetrate through the entire piece of wood, therefore it should be used any time you have an active infestation because you are guaranteed it will kill anything in the wood no matter how deep it is. Also, BoraCare will last forever in the wood so you will never have to worry about any infestations in the wood that you treat ever again. Just to recap if you have an existing infestation, you should use Bora-Care. If you are just treating wood to be used in new construction or surface fungus, then Timbor is fine to use. Both products are very safe, virtually odorless and do not require respirators unless you are in a enclosed space with no ventilation. You should always wear gloves and protect your eyes anytime you apply pesticides or herbicides. All you need to apply either product is a one or two gallon hand pump sprayer. Timbor is used at 1.5 lbs of Timbor to each gallon of water. Bora-Care is mixed 1:1, one gallon of Bora-Care to one gallon of water which will make two finished gallons. Both products should be mixed in a 5 gallon bucket and then poured in your sprayer to use. We sell these products to homeowners every day and they are very successful treating their issues and you can have great success too. Remember that we are always here to help. Good Luck! Termidor vs. Bora-Care - Which one should I use for dry wood termites? I have dry wood termites in my home, and I am wondering if i should use Termidor or Bora-Care? Since you have droppings then that means dry wood termites is your issue and you probably live in CA or FL. If you see droppings then there are "kick out"holes which you should be able to find on the wood where the termites that are inside the wood are kicking out their pellets onto the floor. 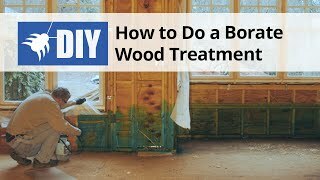 This will help you zero in on the wood that you are treating. Both Termidor SC (fipronil for termites) and Bora-Care will work, but Bora-Care is typically the better one to use for this situation. Termidor SC is not a wood treatment product, so for it to work you have to drill holes EXACTLY where the termites are and it has to touch the termites to work. If you miss where they are, it will not work. Also, Termidor SC does not really have any residual in the wood, so after you treat inside the wood with Termidor SC and it dries, that wood is exposed for future termite and beetle infestations. Bora-Care is usually the preferred choice if most of the wood is exposed and it is raw wood you are treating, meaning it is not painted, stained, or sealed, it is just normal wood. Bora-Care is made only for wood, and you do not have to know exactly where the termites are for it to work which is a plus. Bora-Care is sprayed evenly over all exposed surfaces of the wood and actually penetrates through the entire piece of wood. When the termites in the wood try to consume the wood after it has been treated, they ingest the Bora-Care with the wood and die. No matter where they are in the wood the Bora-Care will find them as long as you treated the exposed wood that you can see. The other main benefit is that Bora-Care stays in the wood forever, so you will not have to worry about termites or beetles infesting the wood that you treated ever again. Once Bora-Care is applied on raw wood, can the wood be painted at a later date? Yes. Wood treated with Bora-Care can be painted, stained or sealed once it is dry which usually takes 24 hours. Can Bora-Care be used on "pressure-treated" wood if it is not painted, or stained? Yes, Boracare can (and in many instances MUST) be used on pressure treated wood. As a termite barrier under Section VI of the label it is required to be applied twice to exterior wall sill plate and that is always pressure treated. All pressure treated wood that is cut or drilled MUST have a field treatment or end cut application in order to meet building code (including sill plate in a home - see IRC 2016 and AWPA Standard M4). It is also useful to treat pressure treated wood as the heartwood is not treated properly by pressure treatment (especially refractory species such as Douglas fir, and the transition wood of pine decking is often the first to rot out and will greatly benefit from a treatment with Boracare with Moldcare at 5 years (see Lloyd et al., 2013). Posts, piles and poles also have the heartwood issue and can be treated but this is often best done with Jecta. My house is approx. 2000 sq ft of crawl space. How much Bora-Care would I need for the job? How much Bora-Care you need depends more on the size of the wood you are treating than just square footage. Also, it's the lineal footage of the wood more than square footage. Here is a link to a worksheet that you can fill out and it should give you the correct amount needed based on the size of wood you have and how much you need to treat. Typically, each gallon of Bora-Care, after mixed 1:1 with water, will treat about 1000 square feet of space, but if you have larger sized wood (for example: 2 x 8 instead of 2 x 4), then one gallon of Bora-Care may only treat 800 square feet. The worksheet should be able to get you an exact estimate.